Sit on the triceps extension machine. Grasp the handles of the machine and place your uppers arms flat on the arm pad, with your elbows lining up with the axis of rotation of the machine. Keeping your upper arms flat on the arm pad, exhale as you push the handles down until your elbows are fully extended. Inhale as you reverse the movement in a controlled manner until you feel a mild stretch in your triceps. Adjust the seat (and the back pad if there is one) so that your upper arms can remain flat on the arm pad throughout the movement. If the seat is too high or too low, your upper arms will not lie flat on the arm pad, in which case your range of motion will be affected. Make sure that your elbows are positioned in line with the axis of rotation of the machine. Do not allow your elbows to flare out; keep your hands, elbows and shoulders in line. Keep your body still (and your back pressed against the back rest if there is one). Only your forearms should move. 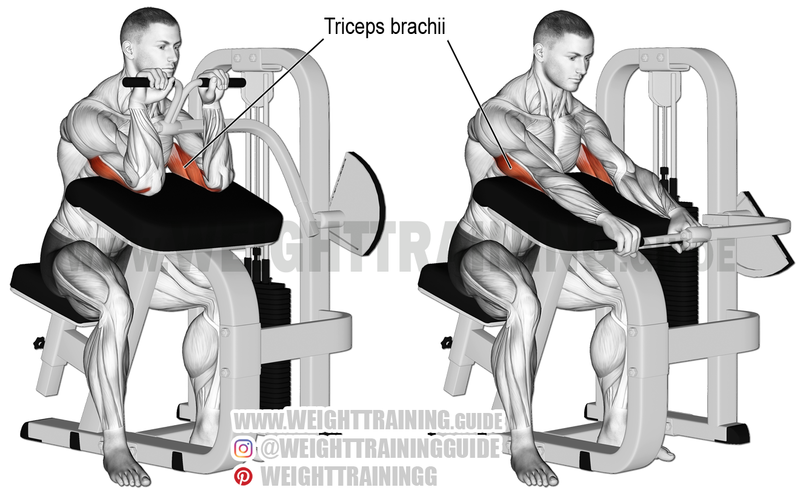 Use the machine triceps extension to safely and effectively isolate and build your triceps brachii. See also the lying barbell triceps extension and the overhead EZ bar triceps extension. Why do most people not like machines?? I love machines! People almost always put down machines in favor of dumbbells and barbells, but machines have their place in the gym. They have their own benefits, they are safer and allow more control of movement. I don’t have a triceps machine like this one in my gym but I do have an overhead triceps machine which I always use.